If you are looking for a fruit forward Pinot Noir in California, I can think of a few areas. The first; Carneros is in both southern Napa and Sonoma county. Russian River is in Sonoma and the Sonoma coast. Pinot Noir like Chardonnay is considered a cool climate varietal. 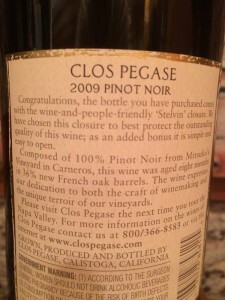 So when you are looking for a good Pinot Noir I would look at the bottle and see where the wine came from. You can see the label notes the AVA “Carneros” and the vineyard the fruit came from. 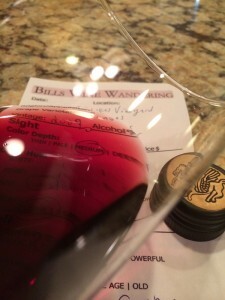 The Pinot Noir was medium in color depth with a nice ruby hue. The Pinot Noir was slightly aromatic and smelled fruity. I could smell cranberry, raspberry, rhubarb, and spice. With my initial sip the Pinot Noir was not dry. It was medium-bodied and the acidity was nice. The tannins were week and soft. The Pinot was very flavorful. Tasting the Pinot Noir I had a sweet mid palate start with a soft dry finish. How much: $35 per bottle. Wine makers notes. 100% Pinot Noir using six distinct clones and selections. Nine months in oak which 35% was new French oak. What are your thoughts about screw tops? I feel if the wine is drank young like most average whites it is no big deal. The verdict is out for cellaring a wine for many years. The crew cap will not allow the wine to age. Did you know, according to the TTB (US Tax and Trade Bureau who regulates wine law). If the wine shows an American Viticulture Area (AVA) 85% of the fruit has to come from the AVA named. If there is a vineyard designation then 95% of the fruit comes from that vineyard. 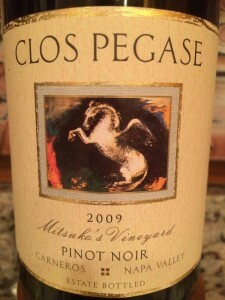 I rated the 2009 Clos Pegas Mitsuko Vineyard three glasses.